The process of making a crown, or cap, usually takes 2 visits to the dentist. On the first visit the tooth will be prepared and an impression, or mold, of the prepared tooth will be made. This mold will be sent to a dental lab so that your new crown can be made. At this point a temporary crown will be placed on your tooth. The crown takes about 2-3 weeks to be returned to your dentist. At this time you will have another appointment to place and fit the permanent crown. Crowns are durable and will usually last about 10-15 years. You should care for it as you would any of your other teeth with regular brushing and flossing. ZIRCONIA vs. PFM (porcelain fused to metal crown). 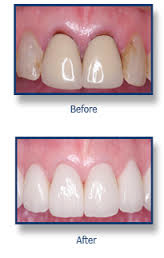 Zirconia crowns are just as hard and durable as conventional porcelain fused to metal crowns. Zirconia crowns, however, are metal-free for that natural and beautiful appearence and will not show an unpleasant dark line near your gumline as some PFM's tend to do after a few years. 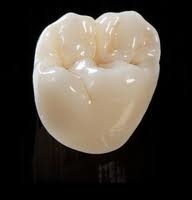 Making a Zirconia crown for your tooth does not require any additional drilling of your tooth structure.